Cast your mind back 12 or so years and the Little Creatures site in Fremantle, Perth was the shell of an old boat yard, previously used as a Crocodile farm. Now, you will find a bustling restaurant/bar come brewery housed in this warehouse ‘shell’ with fantastic home brewed beers and ciders, great food and most importantly a fantastic atmosphere. The brewery is firmly on show, complete with a viewing gallery to next door where you can watch the state of the art machines in motion. 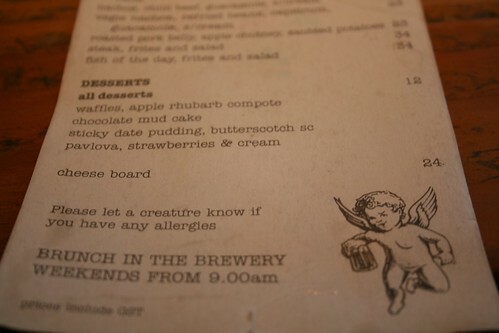 I first went to Little Creatures last year and fell in love with the place. 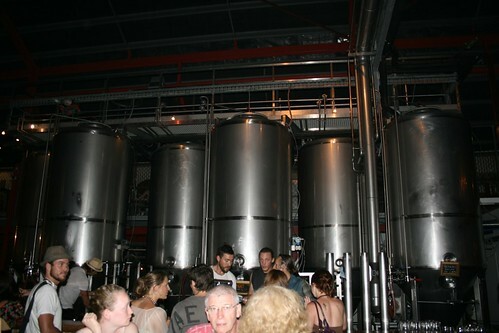 So this year, we couldn’t go without another visit – a trip to Perth isn’t complete without an evening at Little Creatures. 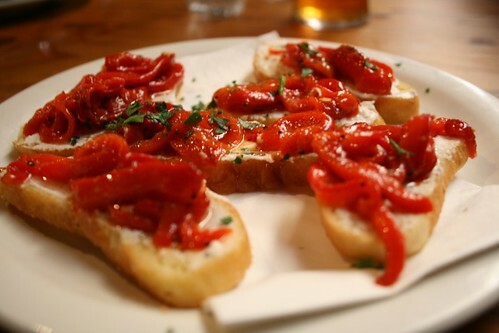 Although the food may not be mind blowing, it’s best to share a few dishes with your fellow diners and soak up the buzzing atmosphere while downing a pint of Little Creatures Pale Ale (although there are plenty more drinks on offer, including their home brewed cider, Pipsqueak). 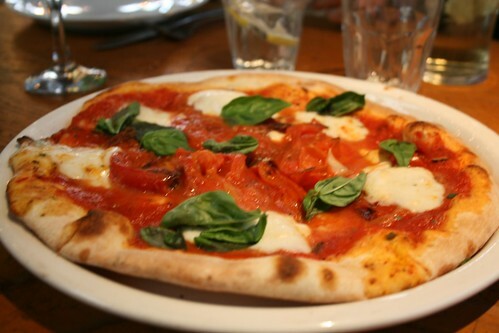 Our group shared the Tomato, Mozzarella and Basil wood fire oven Pizza, Vegetarian Nachos, Halloumi with Roasted Tomatoes, Lentil Curry, Mussels cooked in a spicy Tomato sauce and Red Pepper and Goats Cheese Bruschetta. 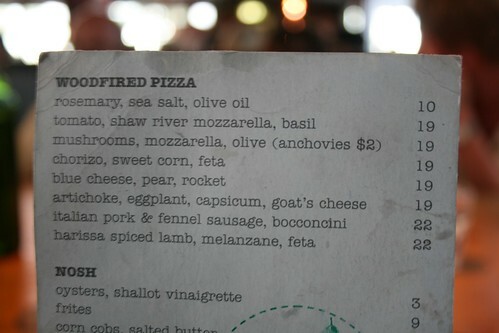 The Pizza was delicious. Simple, but I like it that way. 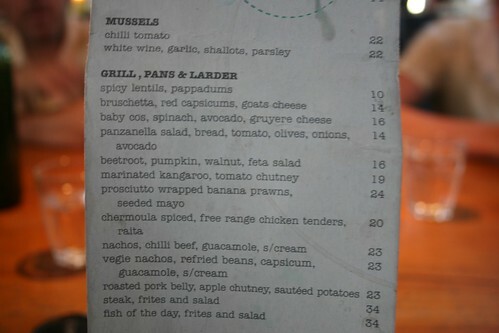 You can’t often go wrong with Nachos, although it is not my favourite dish so I didn’t scoff many. You can tell that this is one of their best selling dishes due to the pile of ready nacho’d up plates sitting in the open kitchen, just waiting to be scooped up and sprinkled with delicious toppings. 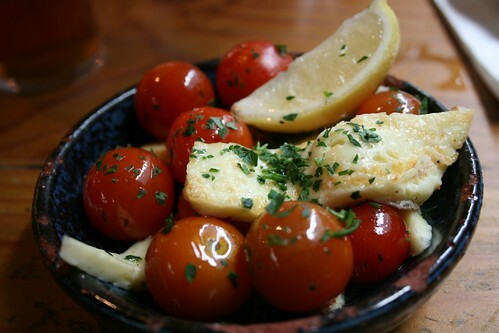 The Halloumi with Roasted Tomatoes does exactly what it says on the tin – the Halloumi beautifully salty and squeaky chewy, matched perfectly with sweet, ripe Cherry Tomatoes. 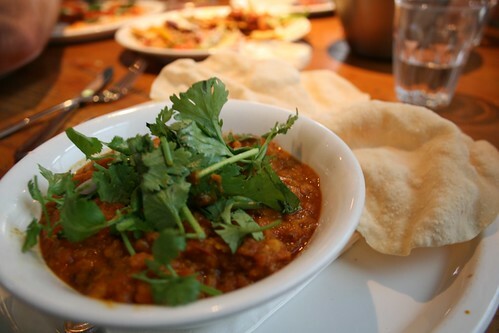 The Lentil Curry is not the kind you would get in an authentic curry house – it is more like the home made kind you’d expect to make yourself but sometimes that’s just what you want isn’t it?! The Mussels and Bruschetta somehow got lost in translation but arrived very speedily after we queried their whereabouts. 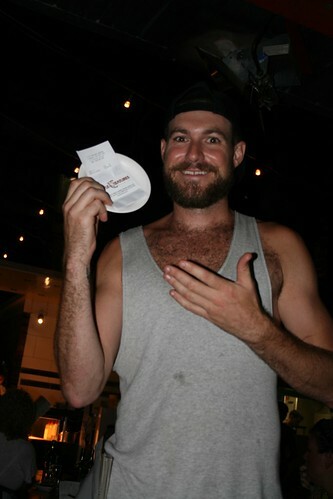 The waiter also straight away offered to take them off the bill. Great service and as we were all sharing the dishes, it didn’t ruin the meal one little bit. Now onto the chips – WOW. 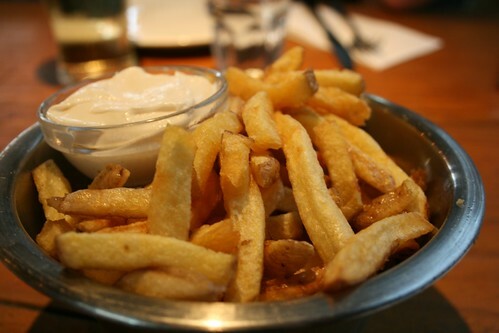 Perfectly crispy potato skin on the outside with a fluffy middle, accompanied by a wonderfully garlicky Aioli. 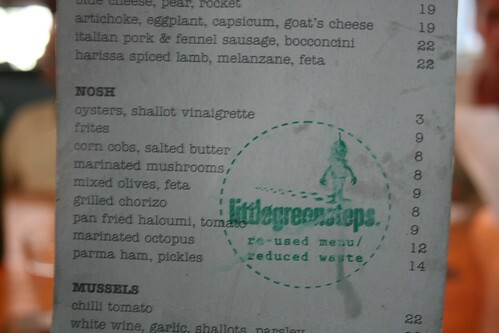 If you go to Little Creatures, even just for a few drinks, please order the chips too! Our waiter provided us with ample entertainment throughout our meal and kept the 13 year old in our party constantly entertained by cracking jokes. The waiters in Little Creatures all seem to be a bit bonkers (in a good way) and provide diners with a good laugh, which makes the visit all the more enjoyable. I didn’t try a pudding as there is a Baskin Robbins right next door that makes the best thick Chocolate Milkshakes. Plus it’s hard to fit any more solids in your stomach when you’re done stuffing yourself.